railway workshop and naval dockyard. The scores were subsequently checked for validity against outpatient groups including patients suffering from anxiety and depressive disorders, insomniacs, myocardial infarction patients, as well as patients undergoing treatment for sexual, menopausal and depressive disorders. While the test was not normed against samples younger than 17, due to the simplicity of language, there has been no compelling evidence against the use of the scales for comparison against children as young as 12.
threshold scores for classifications do not change by these variations. 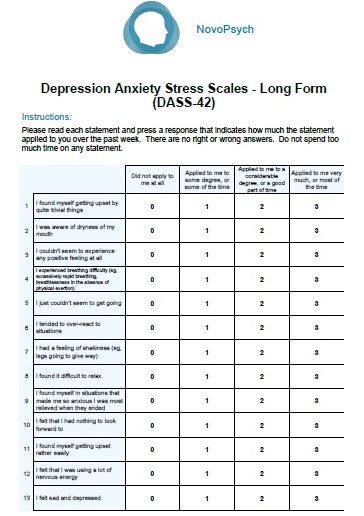 The Depression and Stress scales meet the standard threshold requirement of 0.9 for research, however, the Anxiety scale still meets the 0.7 threshold for clinical applications, and is still close to the 0.9 required for research. The DASS is based on a dimensional rather than a categorical conception of psychological disorder. 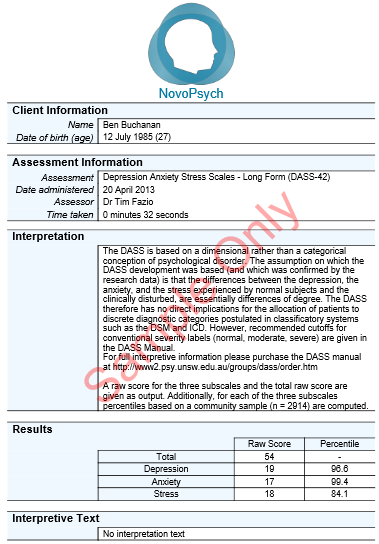 The assumption on which the DASS development was based (and which was confirmed by the research data) is that the differences between the depression, the anxiety, and the stress experienced by normal subjects and the clinically disturbed, are essentially differences of degree. The DASS therefore has no direct implications for the allocation of patients to discrete diagnostic categories postulated in classificatory systems such as the DSM and ICD. However, recommended cutoffs for conventional severity labels (normal, moderate, severe) are given in the DASS Manual. A raw score for the three subscales and the total raw score are given as output. Additionally, for each of the three subscales percentiles based on a community sample (n = 2914) are computed.